Hiya! It is I, Bruce. Today I am here to tell you about the place called New Lanark. 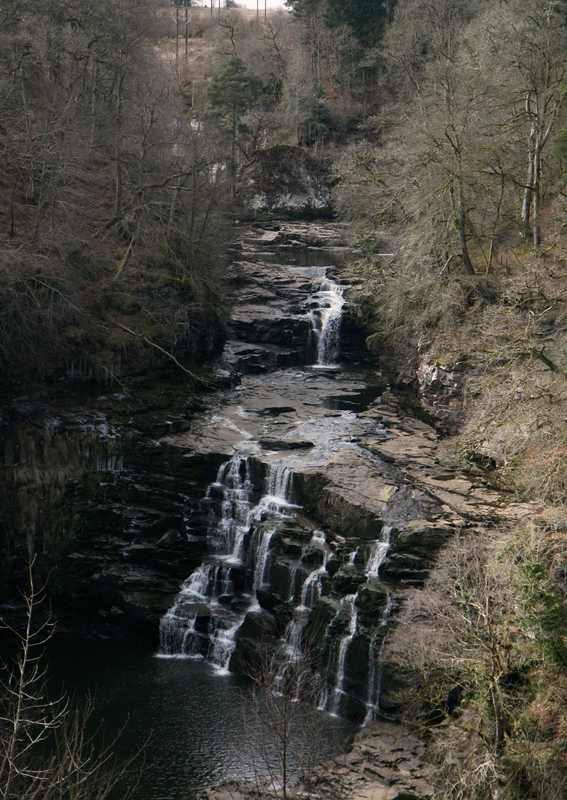 As well as being an important World Heritage Site, New Lanark is a place where you can enjoy the spectacular scenery of the Falls of Clyde. This was definitely the bit that interested me. 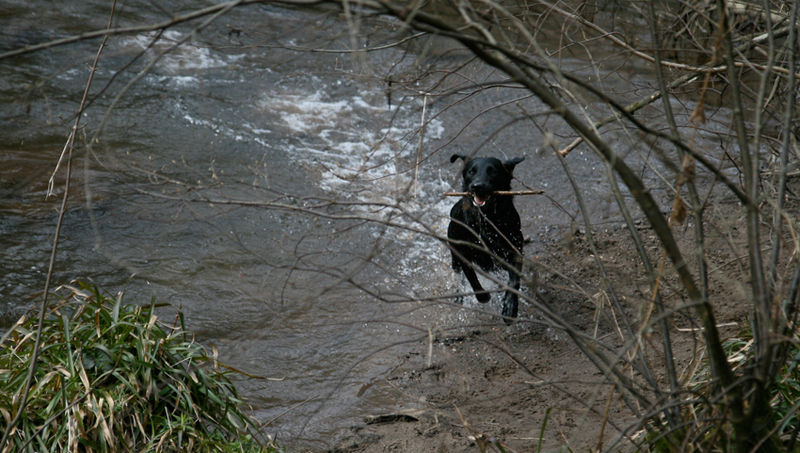 Up along the river banks and woods, there is much fun walking to be had. 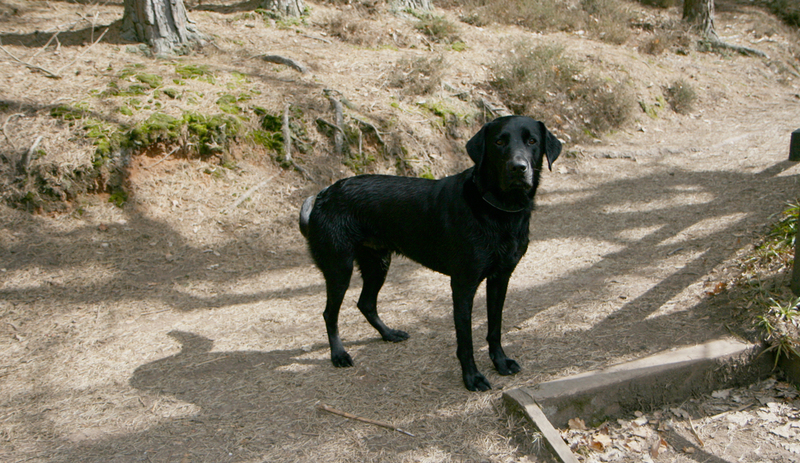 I smelt many interesting smells and went for a swim . 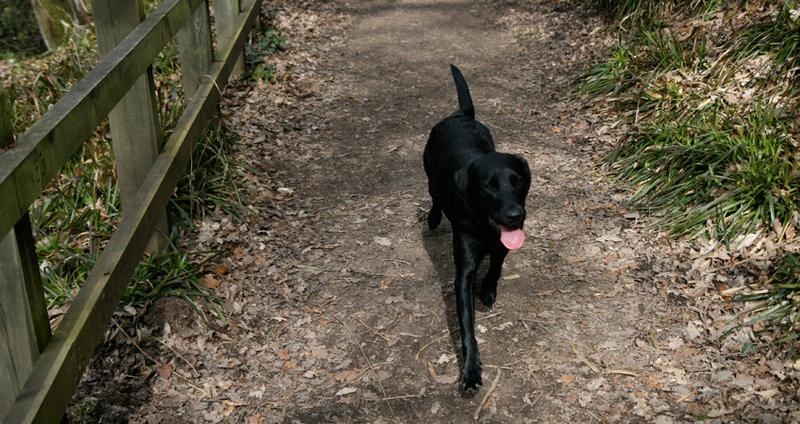 . .
. . .I looked after the humans, hurrying them along the paths, and posing obligingly for photographs.
. . . I also heard some sounds that were new to me. 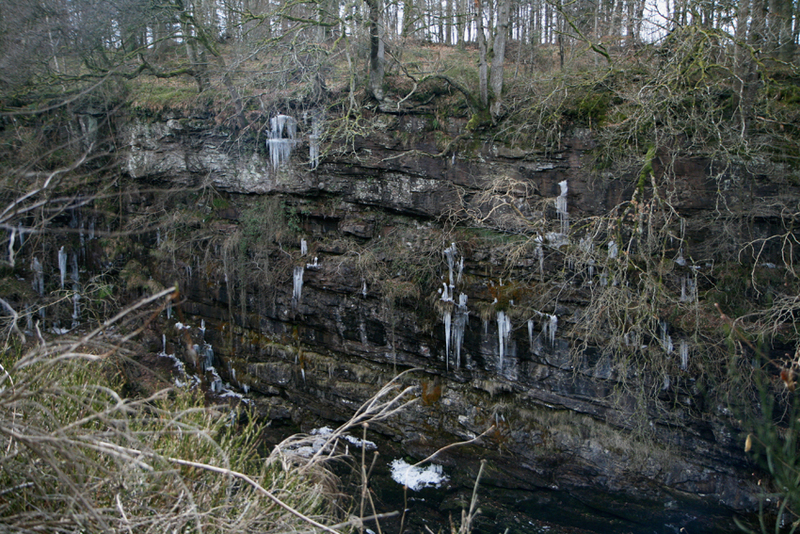 For example, these icicles on the opposite bank made an interesting crrrrrrack and crrrrrash sound as they broke and fell into the river. Then we came to a place called The Hide. There was much excitement around The Hide because The Egg had just appeared in the nest of a Peregrine. The humans at The Hide had equipment through which Tom and Kate could look and see the Peregrine sitting on The Egg. Kate seemed quite interested in The Egg, but was perhaps even more animated by the colour of the Peregrine’s eyelids, which were apparently a very very very bright yellow. I was not allowed to look through the equipment, but I was very good on my lead and did not snaffle any of the Hide humans’ tasty meat-filled sandwiches while they were being distracted by the excitement of The Egg. The naming of things is perhaps the deepest of all human mysteries. For example, why is this crunchy, tasteless, pointless thing called Lichen when there is nothing to like about it at all? 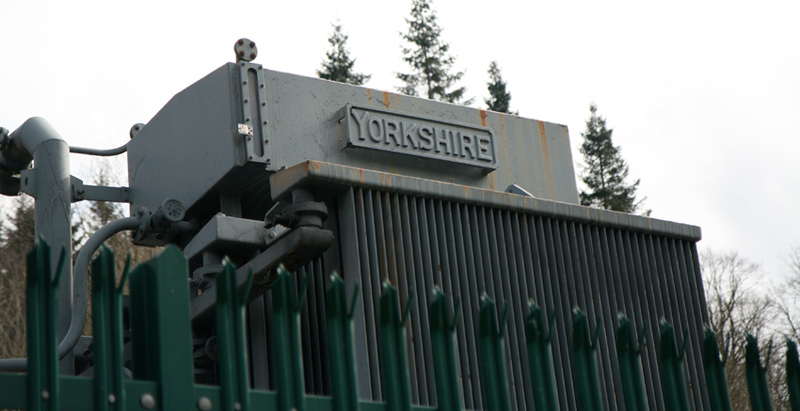 Why is this piece of Scottish hydroelectrical equipment called YORKSHIRE? 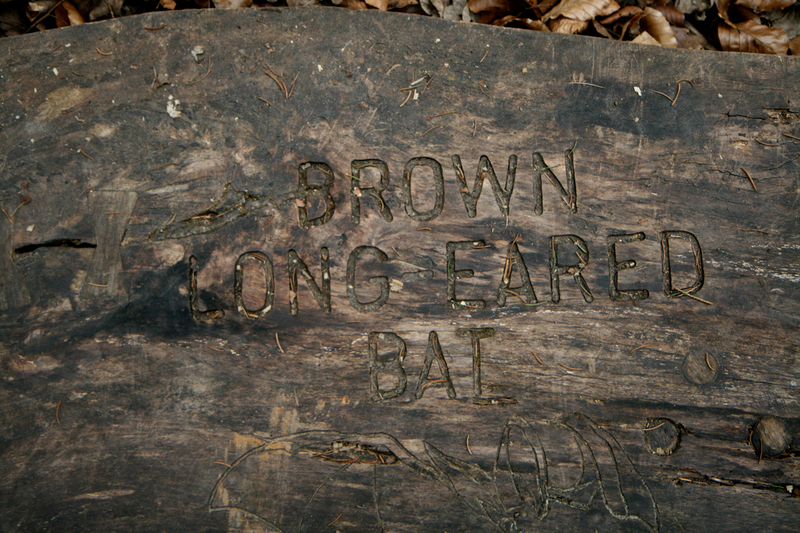 Who named this bench BROWN LONG EARED BAT? 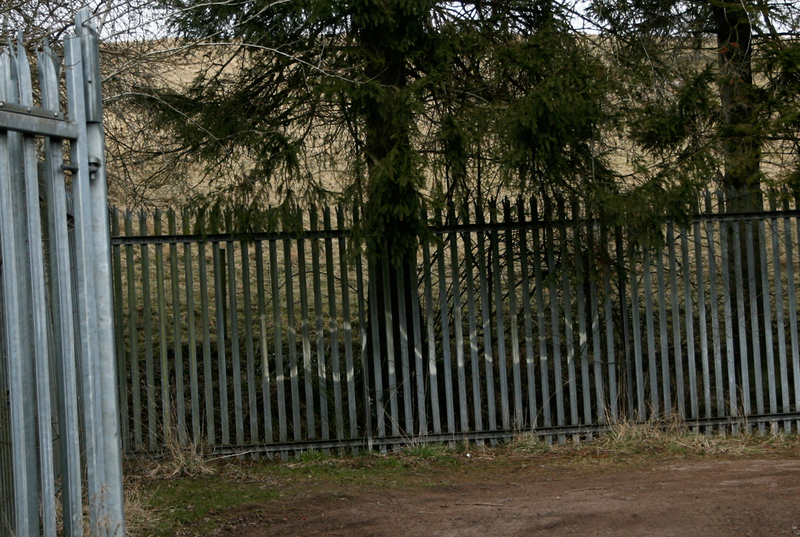 And which daft human decided that this fence should be called DONKEY? Answers on a postcard, please . . .
Hi Bruce! 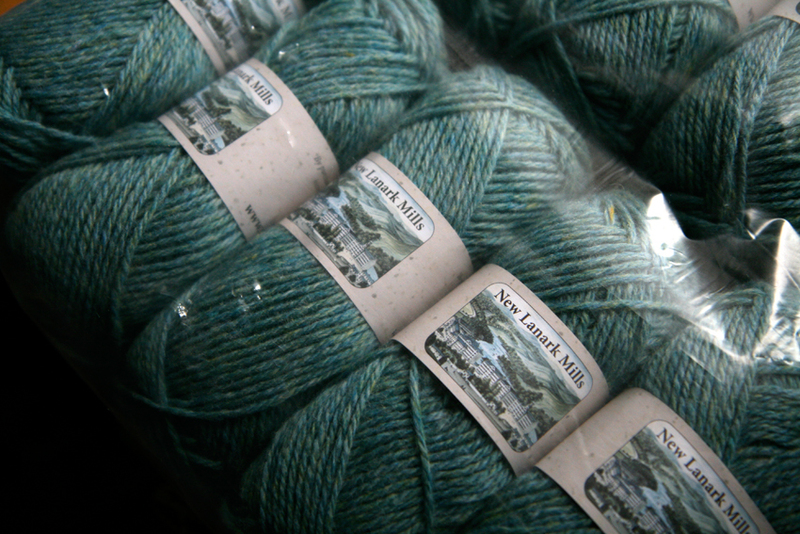 thanks for the nice post :) lovely places you have been to today.. the New Lanark yarn that Kate loves is indeed beautiful and I may have to order some at some point… the history of the mill and the social ideas at the base of it also sounds really interesting, so thanks for sharing! I so love vicarious daytrips as narrated by Bruce the Wonder Dog! I believe I’ll have to start a campaign to visit Scotland; I have a slew of materials since attending our Scottish Heritage Festival at the library over the weekend. 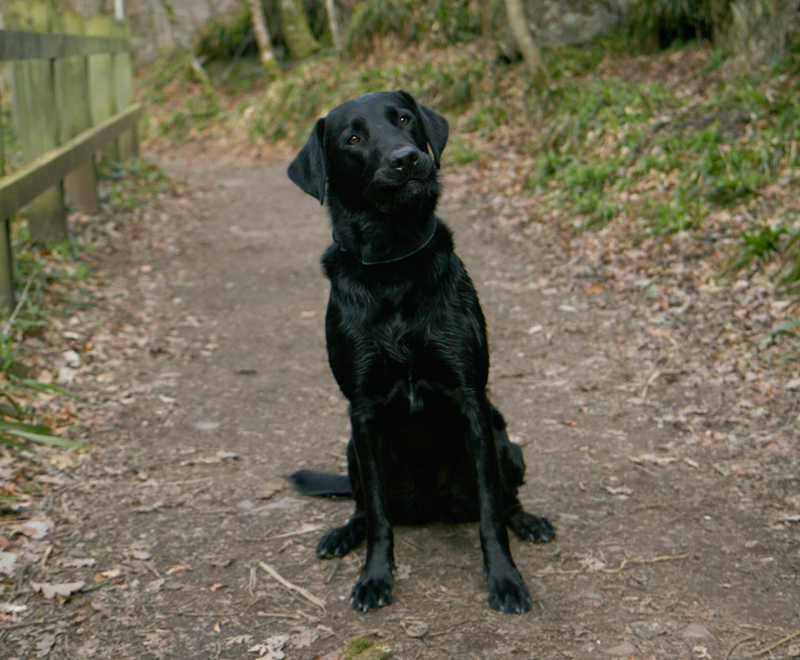 Please is there a dog with a more expressive (and – sorry Bruce- comical) face? Look at the eyes while he has to sit for a picture with Kate. 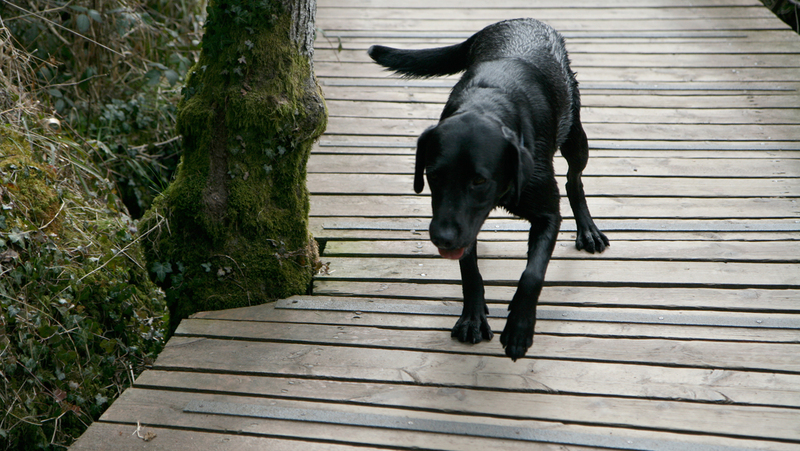 They simply scream “let me get back to my running!” Then the tongue out while crossing the wooden path- the very picture of concentration. Pure puzzlement over the lichen. Is it just me or should this doggie be in the movies? Photogenic plus personality = star! Yo, Bruce! Dawg I see you are getting down with tagging. Donkey on a fence? That’s art, my furry brother! Thanks for the morning walk. You make the monkey sing paw by paw by paw. Dear Bruce, you are a lovely and very intelligent dog. Thank you for sharing your experience, without you I problably never would know New Lenmark, this beautiful place and this precious yarn Mill. A big hug for you and many greetings to Kate and Tom. Have a nice weekend! It would be a pity if Bruce’s walks were spolied by this development. heh…Yorkshire Switchgear made that piece of equipment Bruce (sssh, it’s not hydroelectrical btw, I’m just being pedantic!) Transformer I think, I’m out of practice identifying bits of substation kit! Bruce, I am glad to see your mistress up and about and taking walks. I hope this means she is feeling better and will continue recovering. Yeah Bruce, you made my day. I am rearing a very bossy seven day old chick, who thinks he is a human. My visit to New Lanark is mainly of crowds of visitors hooting with laughter as I scrambled down the bramble covered slope into the ‘town’ picking wild raspberries. I told them how delicious they were, as they were under the misapprehension that I’d want to share! I live next to Lanark County here in Ontario, Canada, a part of the country settled by Scots (really, most of Canada outside of Quebec was!) It also has a history of mills, but sadly, they are no longer producing wool. 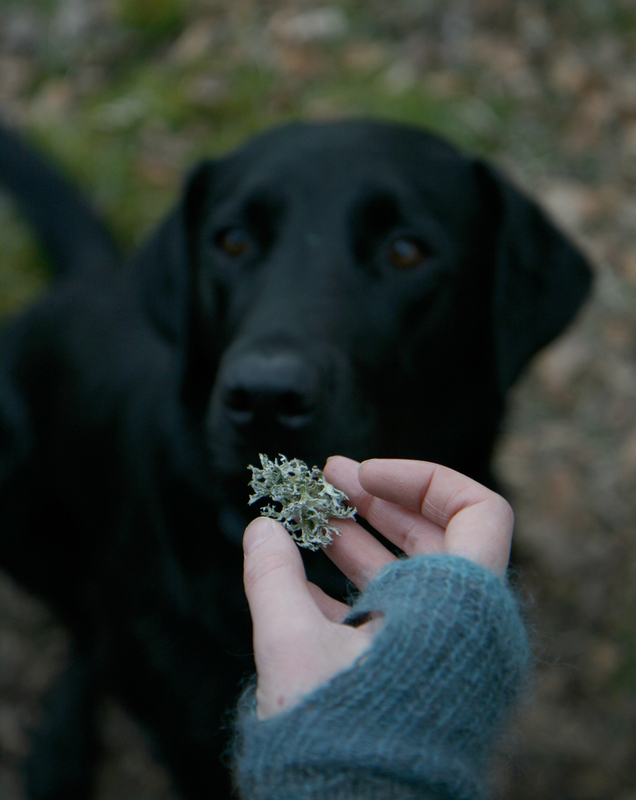 Your walks and photos from the countryside are my favourite part of your blog, apart from the knitting, of course. Just love the posts with Bruce! And the photos in your blog are always so beautiful. Thank you for a great read. At least Bruce walks across the open spots, if awkwardly. 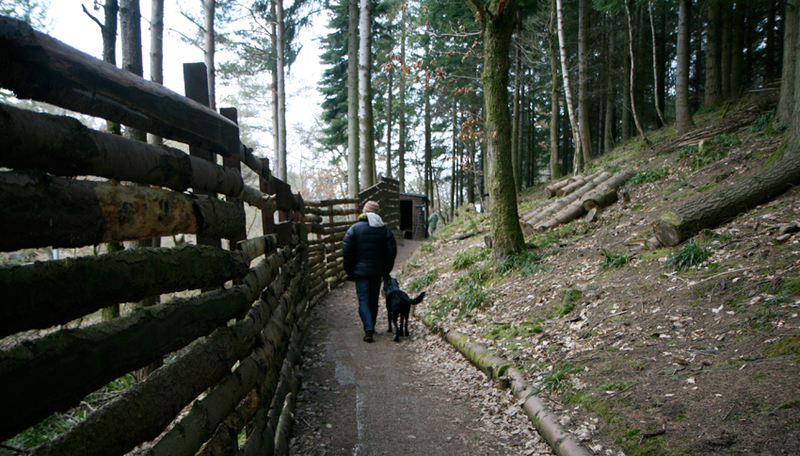 What a laugh we all had when my hubby had to carry our large black lab across a similar path! Ah Bruce, thank you very much for your helpful tour, you handsome hound, you. My dog, Jess, also used to do that endearingly daft lip-biting thing you are doing in the first photo, usually accompanied by a hufff-whine-yelp, whilst waiting at the front door for a double you-ay-el-kay (apparently, she learned to spell). Hi Bruce ,you and my spaniel would get on well ,she hates going over anything with gaps in it! Our regular walk has two such bridges over a river and she ” monkey walks “(love the term ) across and nothing will persuade her to stop or come back once over ! Bruce, you have what we call a “curl lip” in that first picture! Our dogs usually give us that expressions when they want something. I have a feeling you and our Leo would enjoy knowing each other. Bruce, I love your take on things, Take good care of Kate and Tom. Perhaps Bruce needs to add his bark to the local campaign? New Lanark is one of my favourite places to visit too – and for all the same reasons! Looks like you all had a wonderful day together. Thanks for the narrative Bruce! Ah, fond memories of day trips to New Lanark with the kids when we lived in Glasgow. An awful lot of years ago, and I’m STILL trying to find a project worthy of the kilo of oiled wool yarn I bought there! I am so glad to see you out and about, swimming and fetching and generally being curious about things. My human doesn’t take me outside, because she knows I will run away for an adventure all on my own (which would make her very worried and a wee bit sad). Your humans trust that you will stay with them, no matter how many odd things you encounter. My human took some wonderful photos of spring things in our neighborhood yesterday, but I didn’t get to enjoy the outdoors with her; I just snoozed while she was gone. I’m also not a big fan of swimming, but I do love birds! I have never seen a peregrine; I expect I would be fascinated and long to chase it about. I love New Lanark. 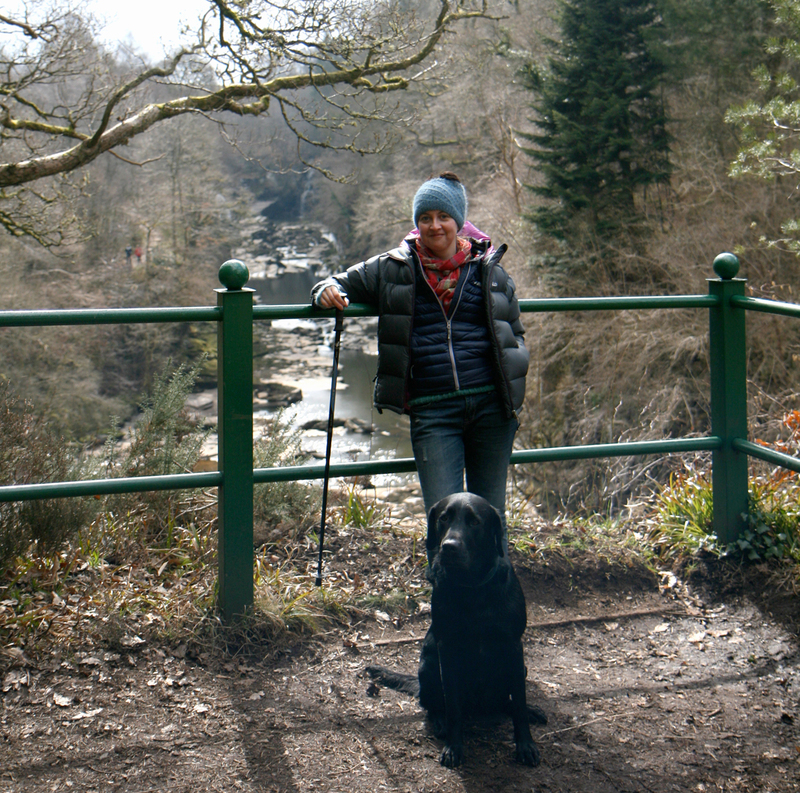 We once stayed in Lanark with friends and stumbled across New Lanark whilst hiking. We had no idea it was there, and suddenly we found ourselves in the midst of a World Heritage Sight. It was a surreal, but excellent discovery. Oh my, that looks to have been a very speedy swim! Bruce and Kate, I learn something new every time you take a trip! Thanks for writing. It is inspiring every time. 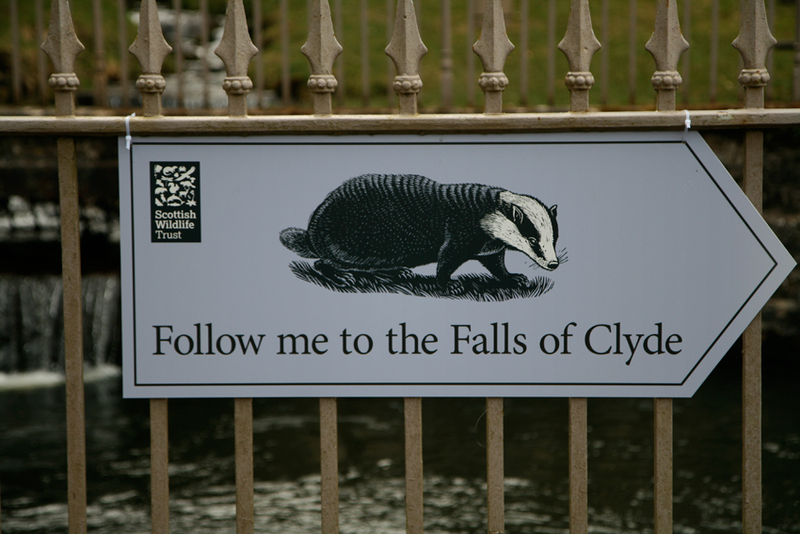 Dear Bruce: I am so envious of you, that you get to visit New Lanark often. I was in your part of the world not too long ago and very much wanted to visit there, but my traveling companions out-voted me, and we went to visit yet another castle instead. I agree with your head-scratching about the naming of things. I often find myself asking the same sort of thing when I see a truck for a certain company here in the United States, where I live. The company is called Yellow, but its logo is actually orange. It’s usually the yarns that grab my attention, but in this case it has all been about Robert Owen, what a guy and if I might say, an honorary Manc. Bruce, if you collect that lichen you can dye yarn with it. Such beautiful amber colours. I love the adventures of Bruce! LOVE Bruce! He looks just like my lovely girl, Dixie! Hi Bruce-you are one of my favorite “Posters” Glad to see you looking so fit and happy. Tell Kate she is looking well also. Bruce, can you ask Kate about that nice looking hat she was wearing? Bruce, even if puzzling, it looked like a very pleasant adventure. You are so handsome! Thanks for the travelouge. Was just reading an Isabel Dalhousie novel that mentioned the Falls of Clyde and your photos make me wish I weren’t a continent and ocean away! So glad you were able to enjoy a delightful outing. Dear Bruce, thank you for the post. I just read it to my husband as part of my campaign for us to do our next vacation in Scotland. As a token of my appreciation, I send you a “virtual doggie biscuit and bone”. Many thanks! Bruce…the world from your perspective is always interesting. Thanks! Oh my Bruce! I love you so! Thanks, Bruce. 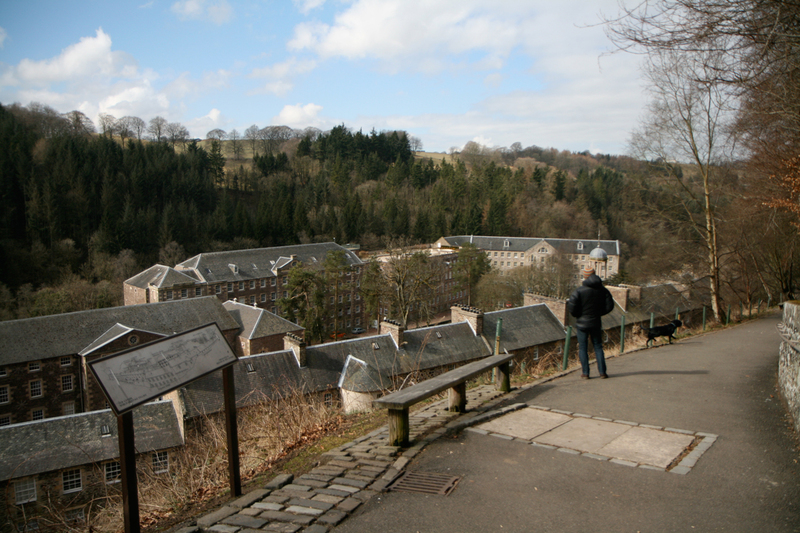 I got to see New Lanark in 2010 when I was in Scotland for the first (and so far only) time. Your view of it is lovely and different from mine! I loved watching the equipment spin some yarns like the ones Kate admired. I can only spin one strand at a time. Those amazing mechanical contraptions can spin hundreds at once–but they do it just the same way I do! Drafting and putting in twist. I went to New Lanark last autumn and loved it! Being from DC it was interesting to see the connection to our own Smithsonian through Robert Owen’s sons… I also may have bought a kilo of yarn. I’m hoping to go again! Bruce, my darling love… one day I’d like to take a walk with you! It’s so wonderful to see the world through your eyes. I love you Bruce. Thank you so much for sharing your adventures. Bruce. You post the best blog pieces. Thanks for letting us see your adventure!